I’m so excited about today’s post because I get to share our (finally) completed guest bathroom remodel project! 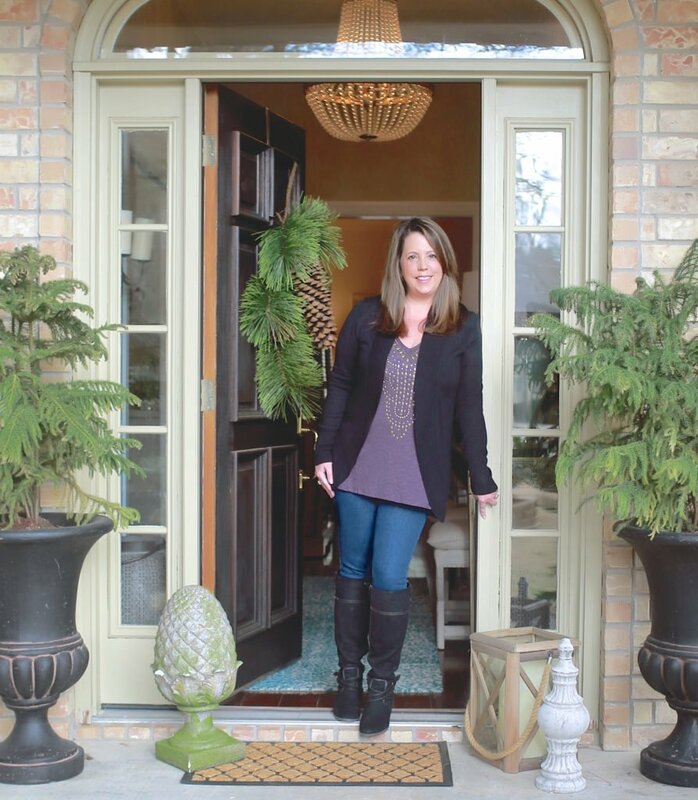 Just to give you a little background, I partnered with Delta Faucet® for this project and the inspiration for our remodel all started late October in Chicago at the “Day of Inspired Design” event, hosted by bloggers John and Sherry Petersik from Young House Love and Delta. I recapped the event here if you missed it. 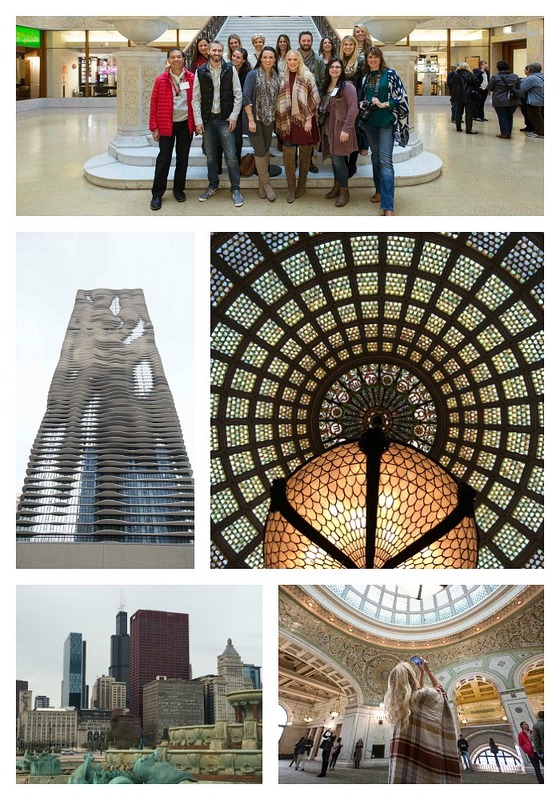 During the event, we were encouraged to find inspiration from a tour of some of the most incredible architectural sites throughout Chicago, including the largest Tiffany Glass dome ceiling in the world, The Rookery, the Aqua Tower and Buckingham Fountain. After our tour, Delta challenged us to create a design board for our dream kitchen or bathroom, incorporating elements of what inspired us from the tour. 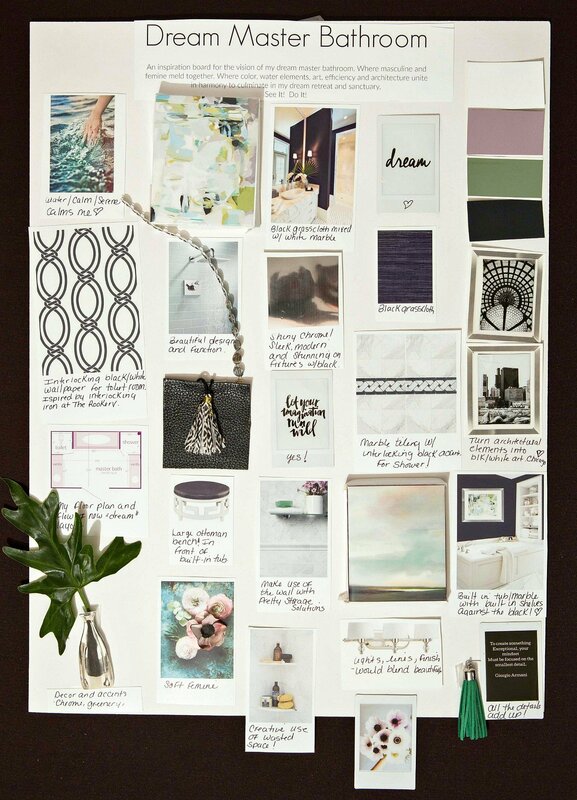 Long story short, this was the design board I created for my dream bathroom. It was SO fun to put together! 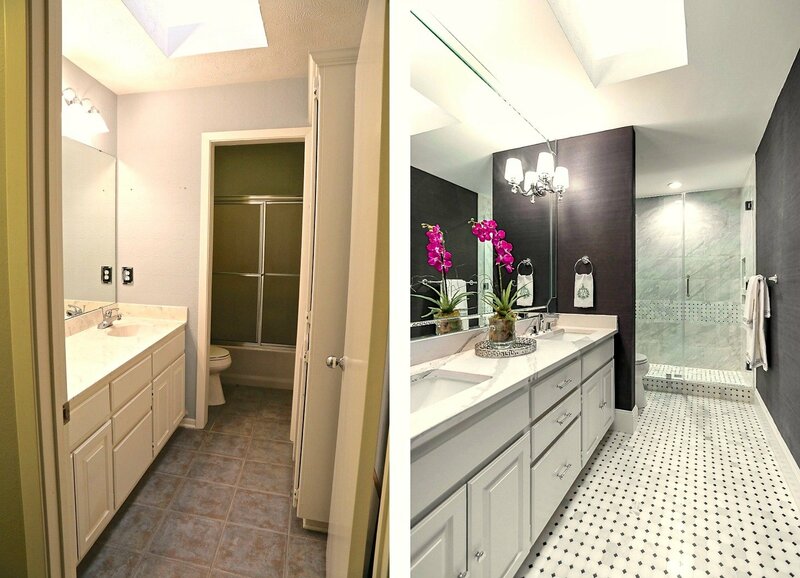 We were given six weeks to complete a makeover of either a bathroom or kitchen based on our design boards. 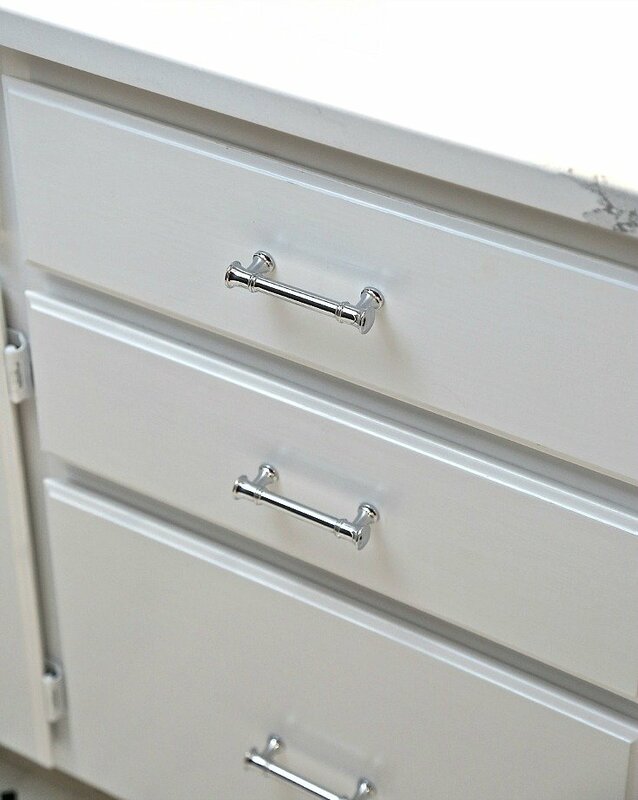 I chose to makeover our guest bath for the challenge and shared my plan on the blog here. 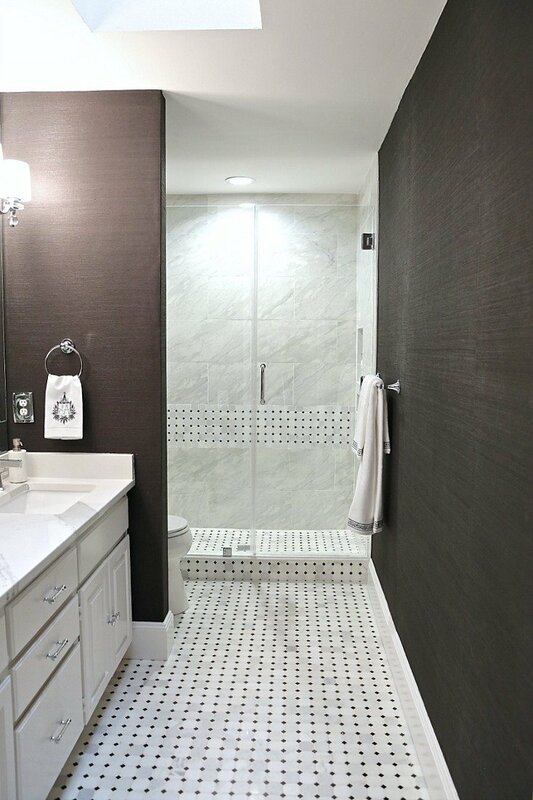 We decided to pretty much gut the whole bathroom and completely redesign the space to open it up, improve functionality and (my takeaway from Chicago) emphasize the architectural elements we were incorporating in the space: the beautiful design of the walk-in shower with floor-to-ceiling tile, the sleek and modern fixtures and the color/texture of the black grasscloth. 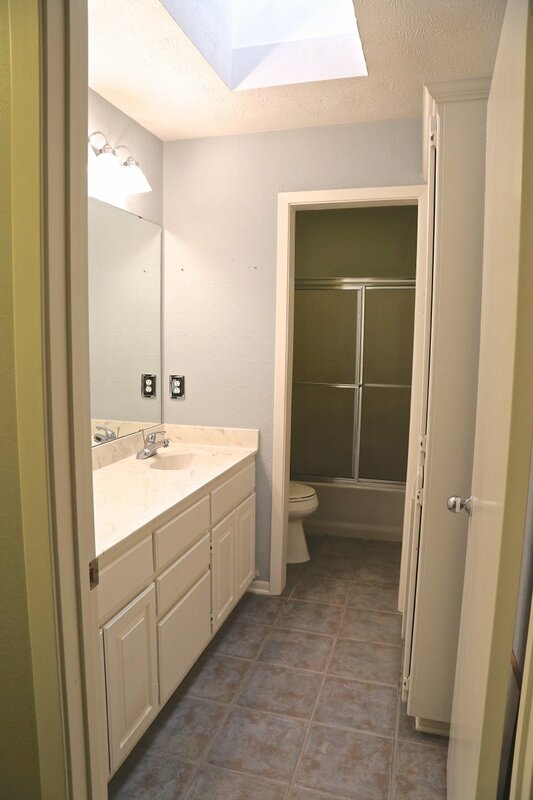 So here are the before pictures of the guest bath. Our home is 30 years old, and the guest bath looked very dated, with a lot of wasted space. Back in the 1980s, so many homes were designed with long and narrow galley-type guest baths. Our fixtures were dated as well, and we had a fiberglass tub/shower combination we couldn’t wait to get rid of and completely fill every square inch with a beautiful new walk-in shower. The end result? Well, we were blown away when the space finally came together and we incorporated our plan. Isn’t that crazy?! I still cannot get over the difference! Just look at this before and after, side by side. Opening the wall over the door to the ceiling and relocating the large built-in linen cabinet to our laundry room made this space look twice as big. Maximizing every square inch really paid off big time! 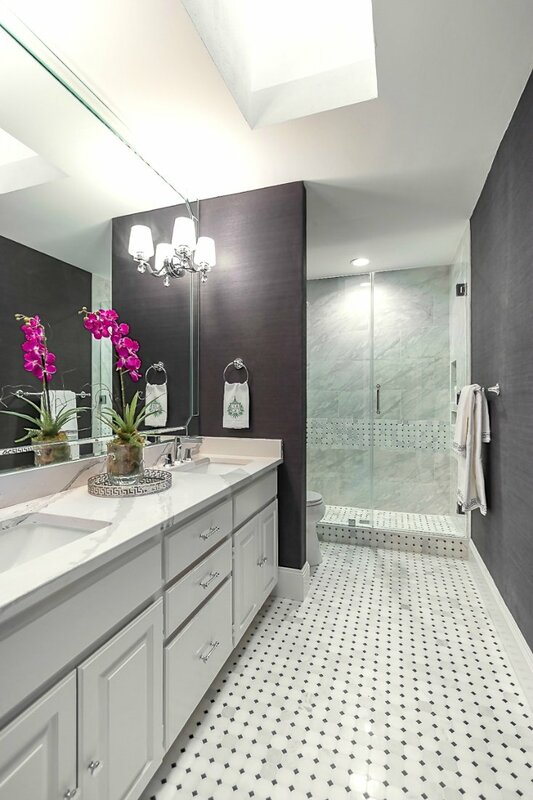 Also, keeping it simple and letting the architectural and design elements, like the fixtures, tile and wallpaper, be the focus helped make the room look larger. 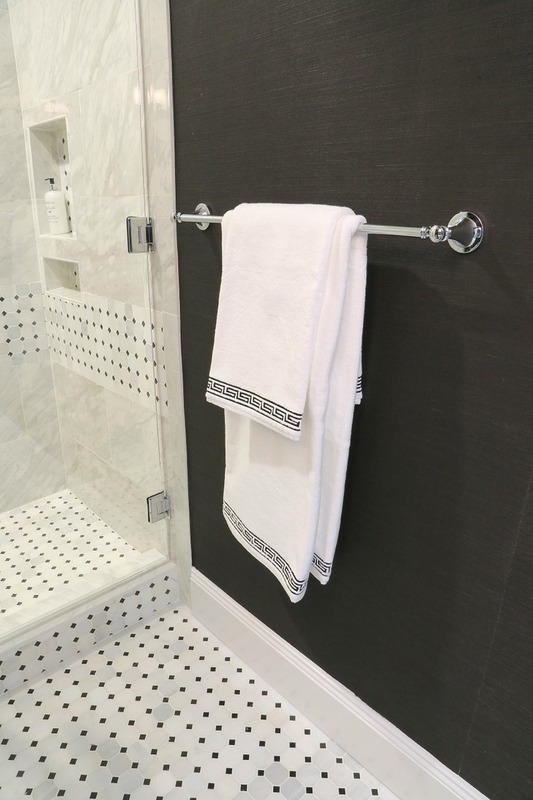 When we came up with our plan, we had a few goals in mind: increase the space and function of the bathroom and use products, fixtures, tile and hardware that are sleek, modern and made with smart design and cutting-edge technology. We felt that if we were going to really update the space, everything we put into the bathroom needed to be as current, from a technology standpoint, as we could get. 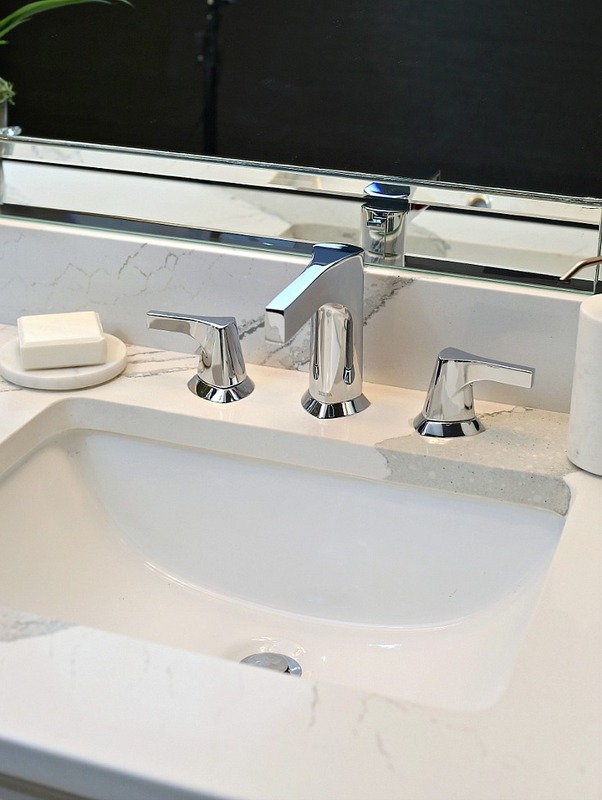 For the bathroom faucets, I chose the new Delta Zura™ widespread faucets in gorgeous chrome, and they could not be more perfect for our space. I fell in love the Zura Collection’s combination of sleek geometric and contemporary design and smart technology. 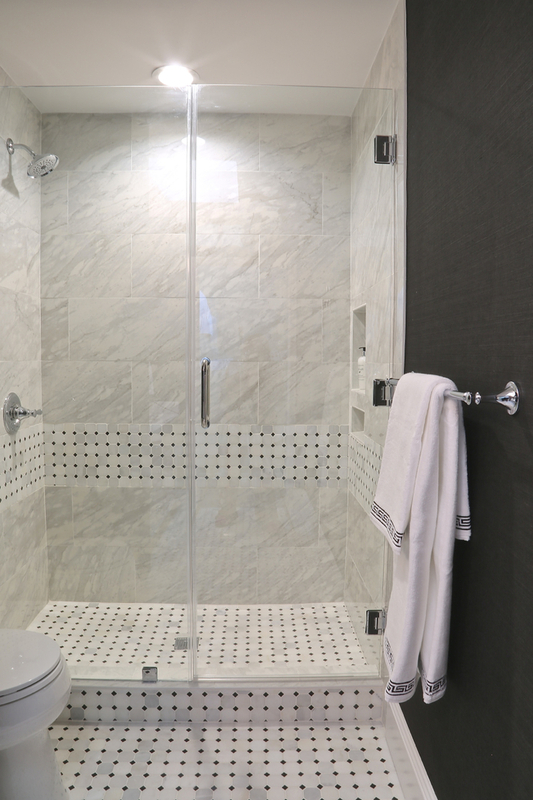 For our shower fixtures, we went with the Delta Silverton chrome round showerhead and one-handle valve. I just love the sleek design and smart technology. 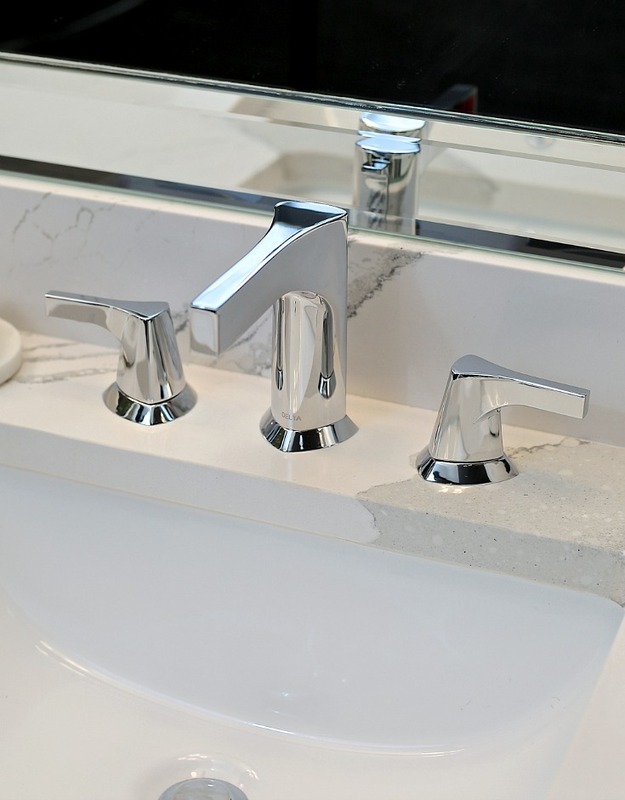 All the hardware in the bathroom is from the Delta Silverton collection as well. The beautiful lines and sleek chrome design of the drawer pulls and knobs instantly modernized our vanity, which we kept and updated. Because the vanity is solid wood, it was the only thing we kept from the original bathroom. 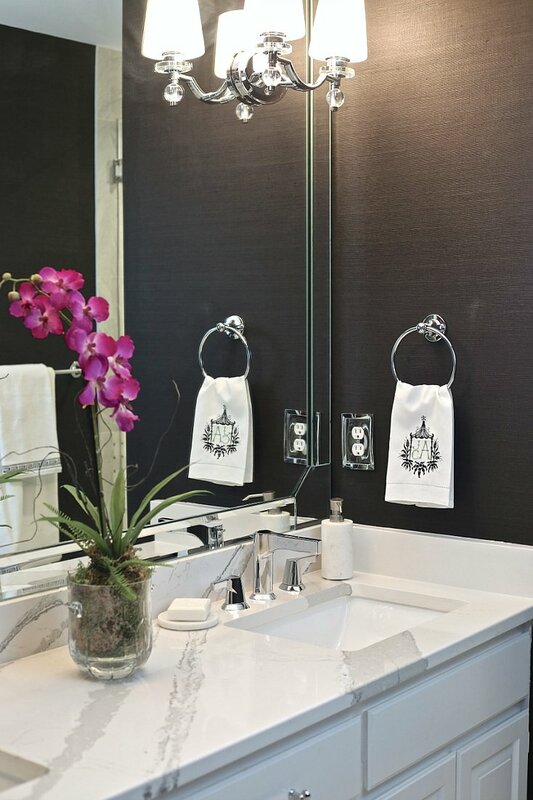 We knew that with a fresh coat of paint and sleek Delta hardware, the vanity would look brand new. To round out the hardware, we chose the Delta Silverton towel bar in polished chrome. It’s sleek and ideal for the space. 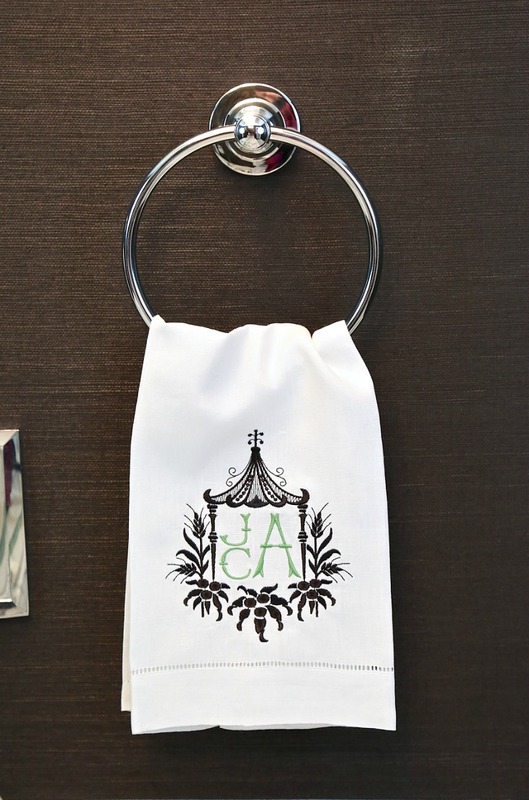 The towel rings, also from the Delta Silverton collection are perfect against the black grasscloth. Our old fiberglass tub/shower unit had to be cut out to be removed. The construction crew couldn’t get it out of there fast enough for me because I was so ready to open up the space. 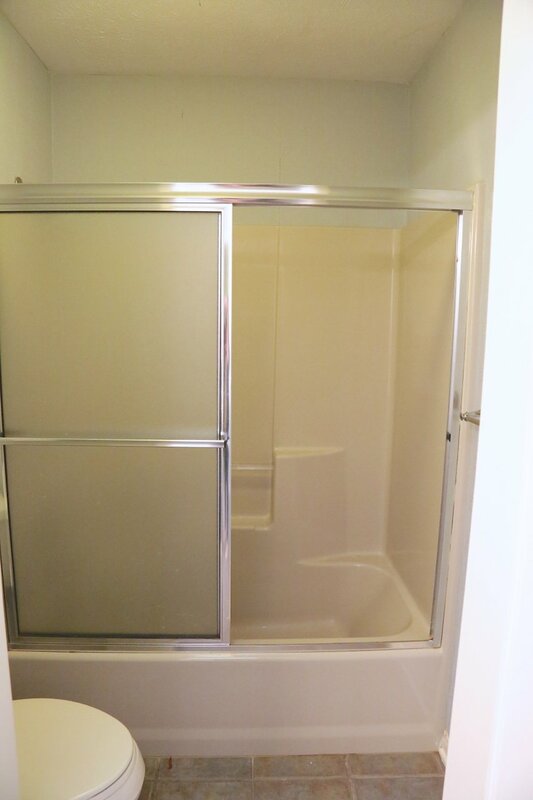 Our new walk-in shower with the frameless glass doors turned out so beautiful! I brought in my local glass company to do the door and customize it just for our space. We built up a curb and tiled all the way to the ceiling. The best thing about our new tile in the shower is that it’s one of the best marble alternative tiles I have ever seen. 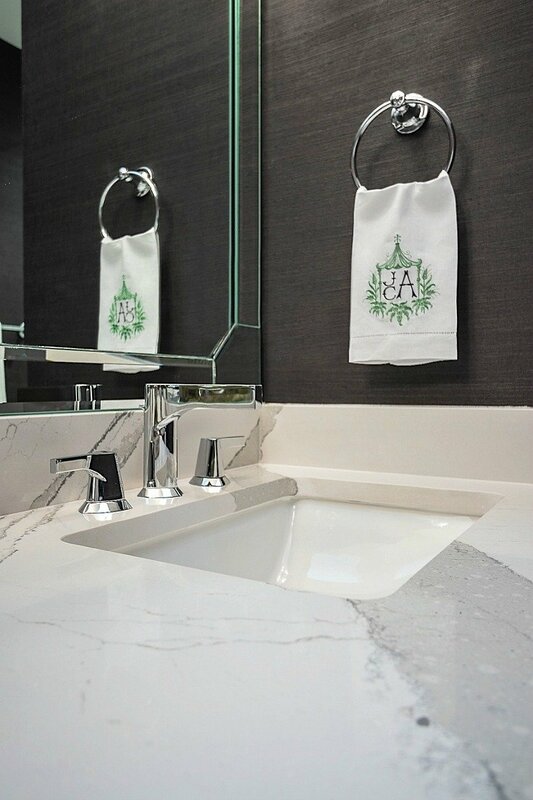 Marble is a soft stone and not the most durable; these marble lookalike tiles are actually porcelain—yes, porcelain, one of the strongest, most durable materials you can use. Better yet, it’s also a very inexpensive alternative. 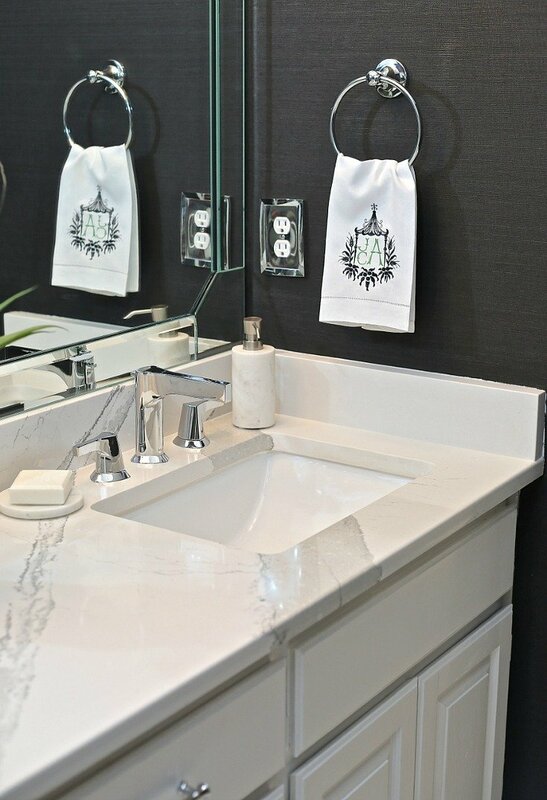 I spent several weeks researching and looking at countertops to make the best decision for the vanity countertops. In the end, I went with quartz because of durability, beauty and the lines in the design. 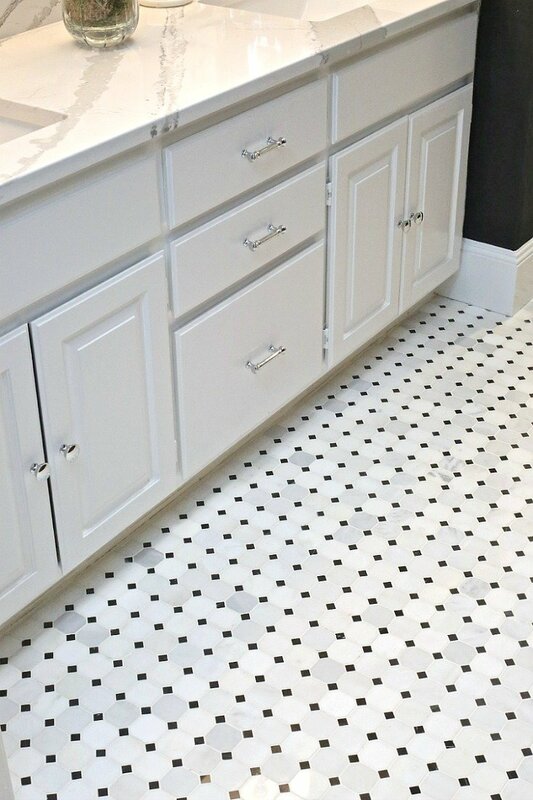 We did use marble on our mosaic floors because I just had to have them and I felt that the design would make the space appear larger. Another big change that really helped open up the space was replacing our vanity mirror with a mirror that went all the way to the ceiling. We also had the glass company cut beveled strips to frame around the sides of the mirror. I’m still waiting on my rug that’s backordered and a few other accessories. There are so many things I want to elaborate on in this project—things we learned along the way and some installation tips. I will share several of those in the coming weeks. 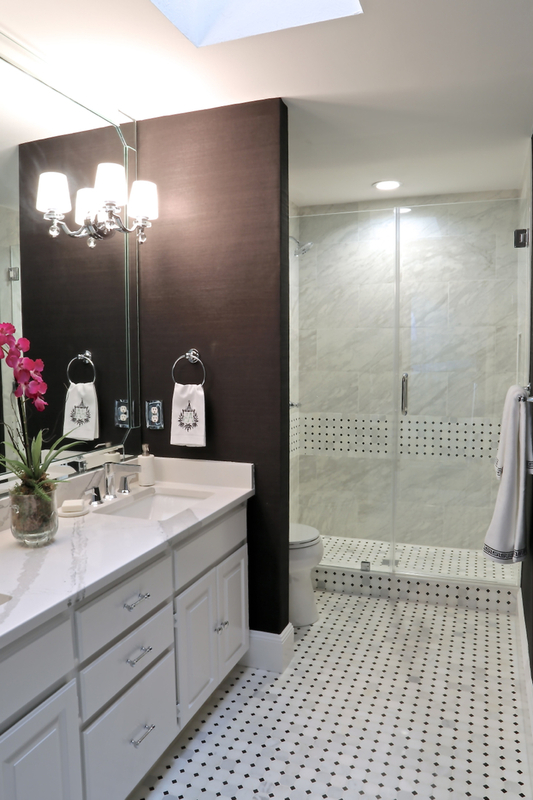 This has been such an amazing remodel project with end results that really blew us away. Of course, we knew there would be a huge difference, but keeping the focus simply on the architectural and design elements from my Chicago inspiration paid off in ways I couldn’t have imagined until I saw it all come together. The space appears even larger and more beautiful than I hoped because the tile, contemporary fixtures and sleek design are the stars of the space. No need to add heavy accessories or art on the wall because they would take away from the beauty of the other details. I’m totally in love with how it turned out! Absolutely gorgeous! Such great choices you made! We are planning a reno for our master bath in the fall. 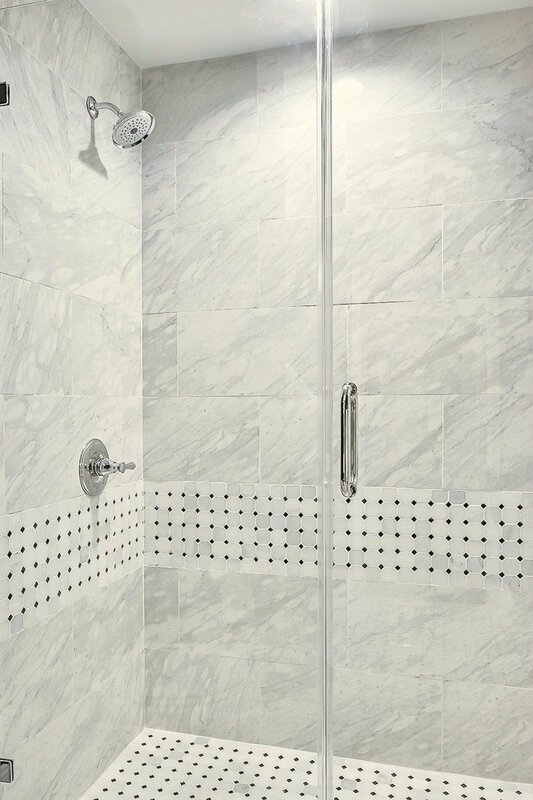 How does the marble accent in the shower and on the floor look against the porcelain tile in person? Thank you so much Kris! Actually, the porcelain tile against the marble mosaics look like they were made to compliment each other. It’s perfect and it needed to be because we did the line of mosaics in the shower. Thanks for your note Kris and I’ll be sharing more of the renovation details over the next month on the blog and hopefully those details can help you plan your project. 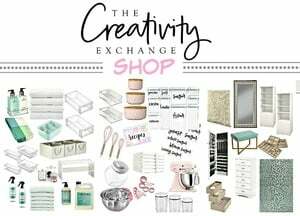 I’m blown away – you did it again, Cyndy!! I was so surprised that the marble in the shower is an alternative marble – great selection! ……..and the quartz top – I love it! 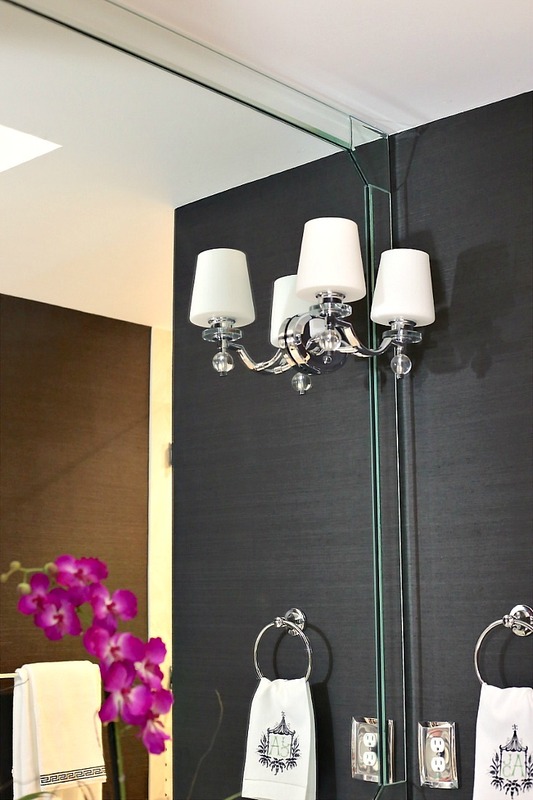 Your light fixtures installed in the mirror – gorgeous! Now my guest bath looks yuck………….. Thanks again for sharing and inspiring us! Would you please list your sources for this gorgeous makeover? 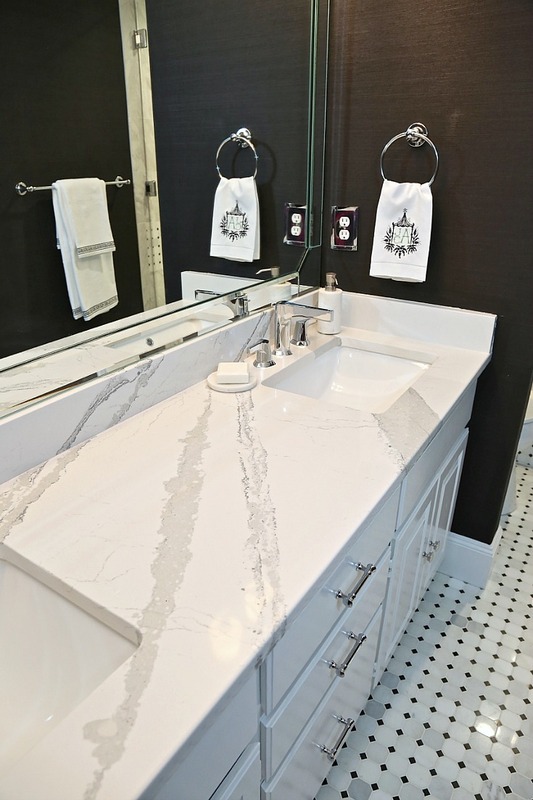 Especially the marble patterned tile and quartz countertop. looks wonderful! What are the dimensions of the bathroom you had to work with? Looks absolutely stunning, Cyndy! 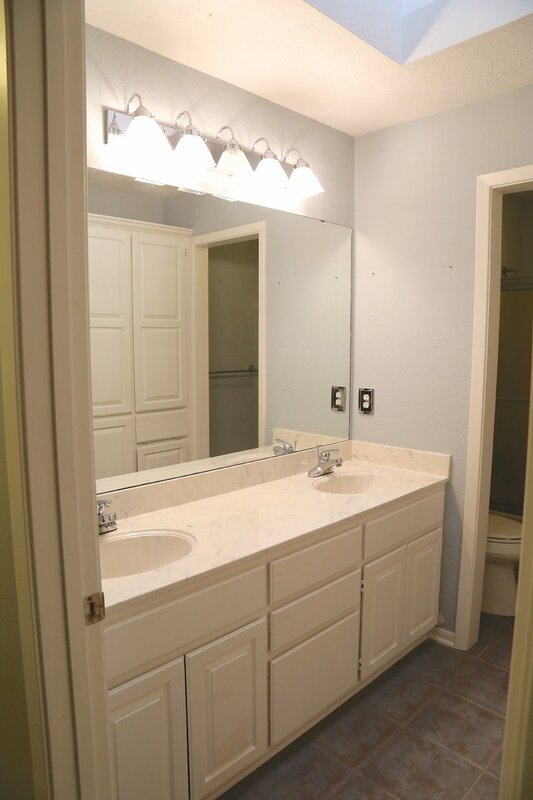 I had to go back and do a double take on the vanity – I thought it was new! The hardware really makes it look high end and spectacular. Love all of the chrome! Well done! Wow, stunning bathroom! Such an excellent choice to change the toilet/bathtub area, it certainly made things much more upscale!! And love the black grass cloth. Black in smaller rooms is such a nice dramatic flourish in a house, especially with white tile. if you already did this I’m sorry but didn’t see it. Explain the outlet cover. Is it glass? Beautiful! 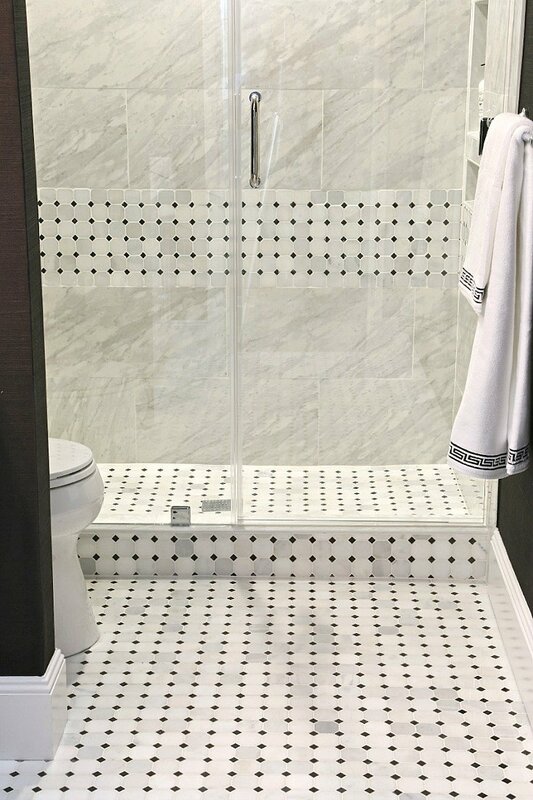 Would you share the porcelain marble-look tile make/size you used for he shower walls?